For other uses, see Mandrel (disambiguation). Not to be confused with Mandrill (the primate species). An example of one type of mandrel is a shaped bar of metal inserted in, or next to, an item to be machined or bent in a certain pattern. Exhaust pipes for automobiles are frequently bent using a mandrel during manufacture. The mandrel allows the exhaust pipes to be bent into smooth curves without undesirable creasing, kinking, or collapsing. Molten glass may be shaped in this way as well. Another example of this type of mandrel is found in jewelry manufacturing, where ring and bracelet mandrels are used to shape metal into a desired size and shape, using a tiny hammer to beat the metal against the mandrel. Another type of mandrel is the chuck that a lathe uses to hold pieces of wood, metal or plastic to be machined as they are turned. In this way, rods can be threaded, furniture legs are turned to have æsthetic patterns, and irregularly-shaped objects can be given a round shape. There are several types of mandrels used with lathes. Original expanding mandrels have a slightly tapered wedge that will expand to hold the item. The Xpandrel method of expanding mandrels was introduced in the mid-1990s. This method uses basic mechanical principles of deformation to achieve expansion of a non-tapered mandrel. Using various methods of actuation, the body of the mandrel is deformed below the limit of elasticity to provide repeatable holding forces without typical deformation caused by pressing on tapered mandrels. Other commercial mandrels are very slightly tapered, and the hollow object slides down the taper until it "sticks". The shop-made mandrel shown in the photo is designed to clamp a hollow tube or gear between the two tapered plugs. There is little about such a mandrel that can't be made right on the lathe on which it is to be used, so it is not uncommon for machinists to make a mandrel to hold a particular item and then set the mandrel aside hoping to use it again some day. Mandrels of this type are usually set in the lathe on centers and turned with a lathe dog. The third type of mandrel discussed here is that which is used to hold circular saw blades, buffing wheels (used for polishing), and sanding discs onto drills, circular saws, and similar power tools. A mandrel of this type generally consists of a cylinder, threaded on one end, with a washer brazed onto the threaded end and an accompanying screw and second washer used to clamp the circular saw blade, sanding media, or other rotary tool onto the mandrel. While most mandrels are driven by direct connection to an electric motor or engine, other mandrels are driven by attachment to a bearing-supported, pulley-driven shaft. Mandrels are also used in industrial composite fabrication such as in filament winding. During the manufacturing process, resin-impregnated filaments are wound around a mandrel to create a composite material structure or part. The structure is cured and the mandrel is removed. 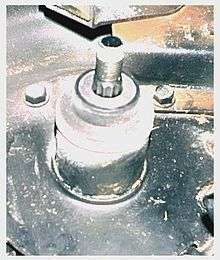 One problem with this type of process is that the mandrel can be very difficult to remove once the part has been cured. As a result, engineers have created a new type of mandrel that has the ability to change shape and be easily extracted. When heated above a certain temperature, the mandrel becomes elastic and can be manipulated into the desired shape and then cooled to become rigid again in the new shape. 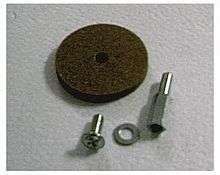 It can then be used in the filament winding process. Once the composite part is cured, the mandrel can be reheated until elastic and easily removed from the cured part. These types of mandrels can be used repeatedly. In the production of steel core used for flexible drives, the centre wire upon which the subsequent layers are wound is referred to as a Mandrel. This "centre wire" may itself be composed of either a single wire or layers, depending on the sizing of the finished product. Mandrels are not recent inventions. Metal machining utilizing the spinning process has been recorded as far back as ancient Egyptian times. 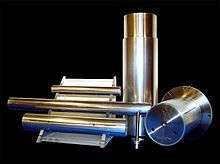 In metal spinning, a wood or metal spinning mandrel is used, the form of which corresponds with the internal contour of the part to be produced. This method securely clamps the raw material and allows for accurate machining into the desired final form. Since the material is clamped internally, there is no interference to the operator from the lathe/mandrel assembly during production. Also, the traversing mandrel was introduced around 1700, and instantiated the design of a lathe mandrel able to slide axially in its bearings under the control of the operator, so that components having short lengths of thread could be produced, such as screws. The traversing mandrel was primarily employed by clockmakers and ornamental turners during this era. Eventually the device was superseded by a mandrel-driven device called a leadscrew, which uses a train of gears that can be altered as required for the turning application. ↑ "Smart Mandrels". Cornerstone Research Group. Retrieved 2009-09-30. ↑ "The Smart Mandrels Trapped Tooling Process". Cornerstone Research Group. Retrieved 2009-09-30. Look up mandrel in Wiktionary, the free dictionary.